Fifteen happy hikers decided to beat the Ashland heat by hiking to the top of Hobart Bluff. Along the PCT up to the Bluff we saw many different wild flowers, including Fawn Lilies, Lomation, Balsam Root, and Phlox. We had a nice breeze all day with temps in the low 70s. We got up top shortly after 11 am and had a leisurely lunch finished off with dark chocolate. We were visited by a friendly dog who preceded two humans and two more dogs. We had a beautiful view all around despite smoke in the valley from the controlled burn. The group arrived back at the Hwy 66 parking by 1 pm and two of our four cars went to the GreenSpring Inn for refreshments. 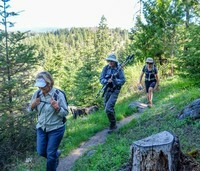 We visited with a hiker from SoCal (Jane Udall) who may join the group next year when she's in Ashland. 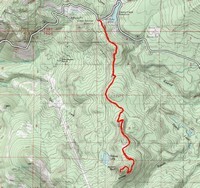 Next Monday we'll be hiking to Rainie Falls.